I live close to the largest spruce tree in Canada. And for me, this is a treat as trees are my favourite people. 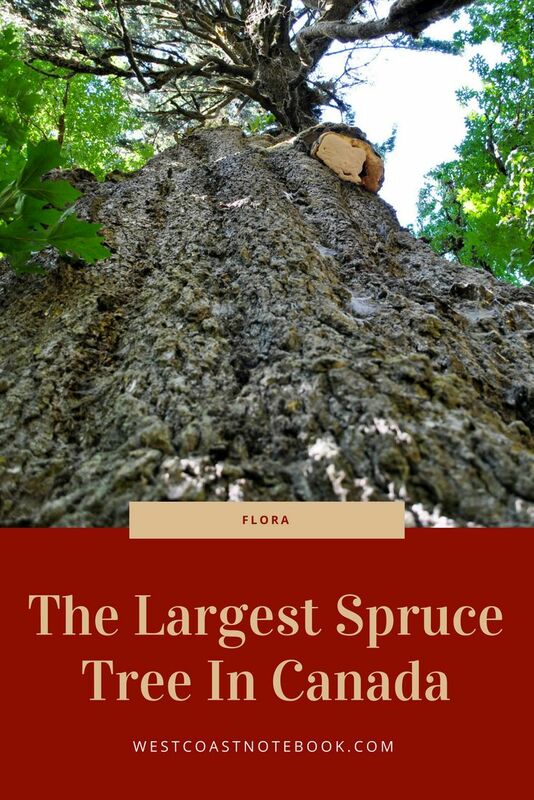 Actually, I live within a 90-minute drive of the largest spruce tree in Canada as well as the world’s largest Douglas Fir tree (Red Creek Fir) and the gnarliest tree in Canada. In two and a half hours I could be at Cathedral Grove which is an old growth forest in MacMillan Provincial Park. The park is home to a famous, 157-hectare stand of ancient Douglas fir, known as Cathedral Grove, which draws visitors from all over the world. The park provides the only highway-accessible protected old-growth Douglas-fir forest in British Columbia. In 2007 Cathedral Grove made the short list on CBC television’s competition Seven Wonders of Canada. But, last week I visited the San Juan Spruce, Canada’s largest Sitka Spruce (Picea sitchensis). 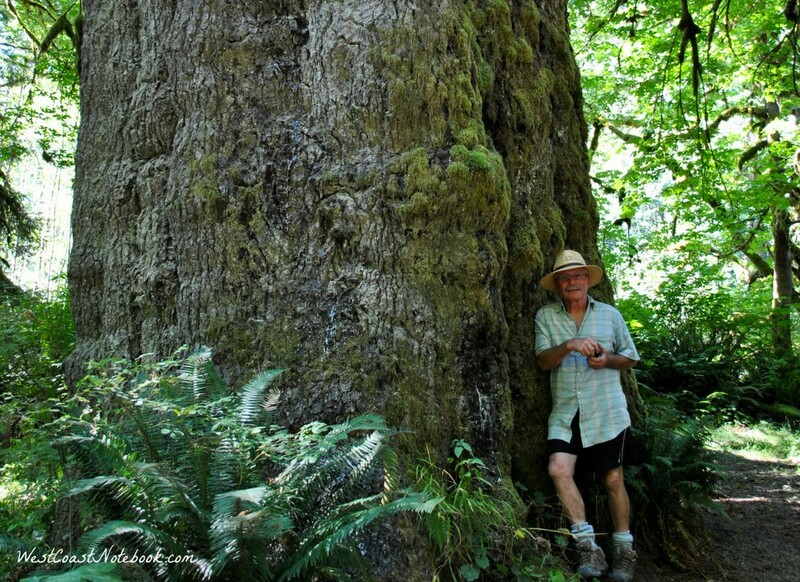 Actually, it’s the second largest Sitka Spruce in the world. The first being the Queets Spruce in Olympic National Park, Washington. It is situated near the town of Port Renfrew about 20 km east and it’s right beside the San Juan river and campgrounds, hence the name. We have visited it often in the past and this time went to look at the new improvements that had been made. These improvements consisted of 12 additional campsites that will need a few years on them before they become a place I would want to camp. They are looking a little like a gravel pit with a picnic table thrown in, but as the trees and brush grow back they will be transformed into desirable spots. At least that was the original size recorded a few years ago, but since then, it looks like part of the top has broken off in a storm. Actually, one winter when we were up there a part of the limb had blown down and was stuck into the ground. It landed with such force it was like Arthur with the sword in the stone. Totally immovable. Someone finally cut off the top and the remains are slowing being reclaimed by the earth. You wouldn’t want to have been under it when it fell. I guess that is why when we arrived at the campground there was a crew from Integrated Operations Group. What they were doing was to cut off the dead or dying limbs that could break off and crash to the ground. 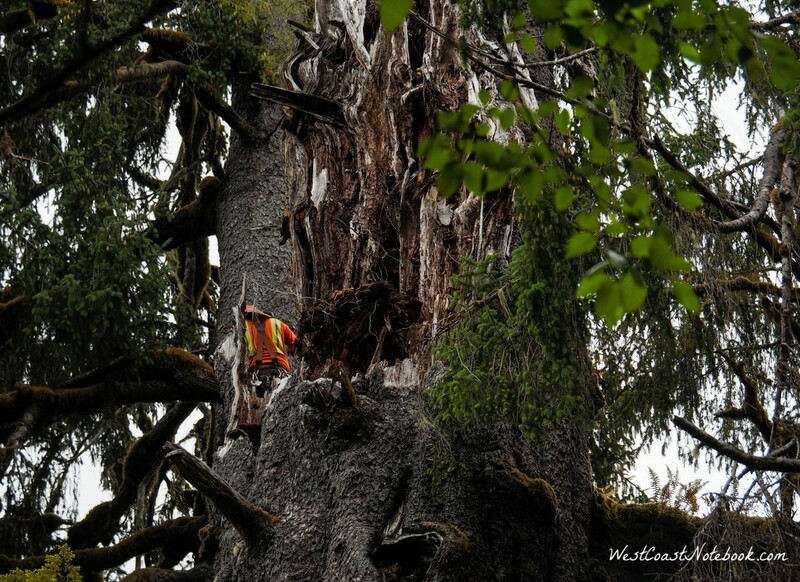 The largest Sitka Spruce in Canada was getting a trim! 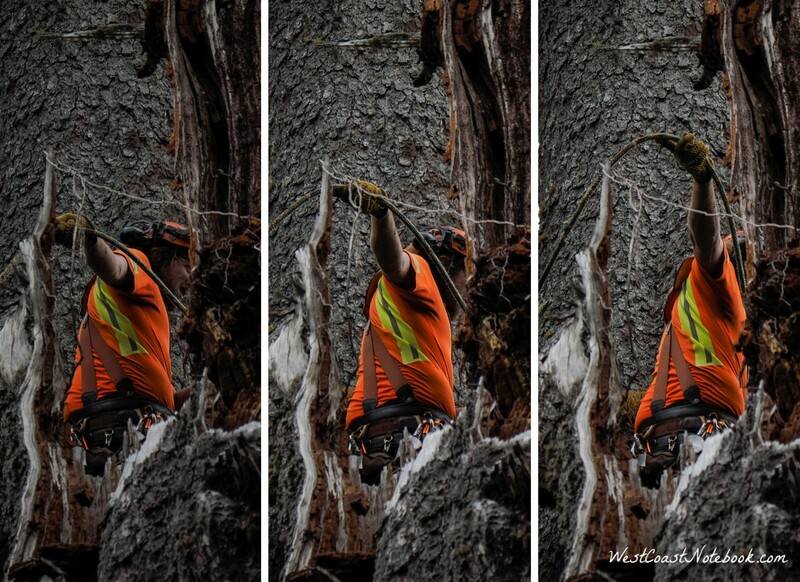 It was fascinating to watch as first of all I’m sure they wouldn’t be able to do their job without my supervision and second, I grew up in a logging family and it was interesting to see first hand the process of tree climbing. In talking to one of the arborists he said they did a lot of helicopter logging for speciality trees which required they spend most of their day up a tree even eating their lunch in the canopy. They would start at the bottom cutting off the limbs as they climbed up with ropes and spurs attached to their boots. As you can see from the tree above it’s a little smaller in circumference than the San Juan Spruce but I just wanted to give you a visual of the type of work these fellows do. The guy who was trimming the spruce looked like a spider climbing up a sapling. In the picture above the fellow trimming the tree is actually on a side trunk that is massive as well and what you see in the foreground is the top part of the main truck broken off. Zooming in with my camera I watched as he cut off a limb and as we were waiting for it to hit the ground there appeared to be a snag. He cut off the largest part of the limb and it was then I remembered I should be taking a video. What you are seeing is him hauling back up the part that caught and letting it fall to the ground with a thump. The amount of energy and effort that goes into not only trimming the tree but climbing it as well is astounding. A I watched he threw the rope over and over to get around the tree and then catch it on the other side. The rope is then secured to him and forms a loop around the tree which allows him to move up one step at a time. I had never watched someone climb a tree before. I had seen lots of people climb poles, but trees have limbs and you need to be able to navigate them and still stay safe. It’s an incredible feat just to gain 3 feet going up this massive trunk and I can’t imagine doing this on a daily basis. I take off my proverbial hat to these men. As he got ready to move up the trunk I captured this short video. Watching this man climbing the tree took me back to hearing my dad talk about climbing and topping trees and had never really realized all the energy and time it took to do so. Gave me a new appreciation for what he did.